I was visiting my family in Missouri this week and my sister and I made this recipe for Shrimp Over Cumin-Scented Beans & Coconut Rice and it was outstanding! We love to cook together and put our own twist on recipes. This one was so fun to make and the everyone raved about it ... even my 3 year old nephew tried it! Preheat oven to 400°. 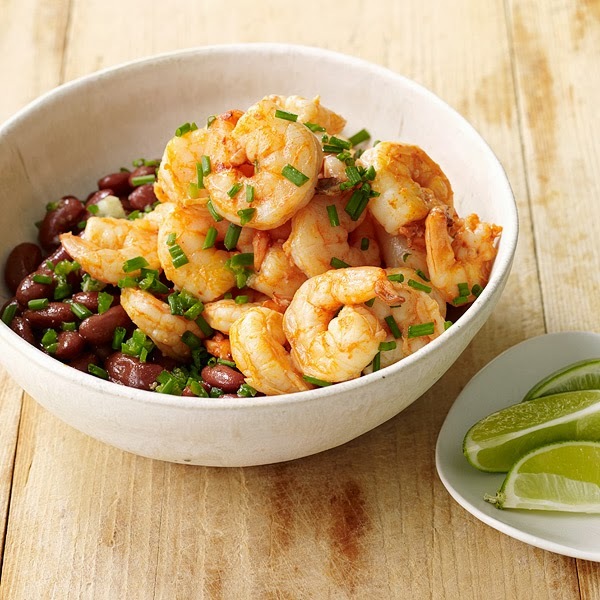 Arrange shrimp in a medium bowl and toss with the lime juice and paprika. Marinate for 10-15 minutes. Wash the rice and drain. Fill medium saucepan with 1-1/2 cups water, 1/4 cup coconut milk and a pinch of salt. Bring to a boil. Add the rice, stir and bring back to a full boil. Cover and turn down heat to low. After 15 minutes, remove from heat and fluff with a fork. Meanwhile, heat the olive oil in a large saucepan over medium heat. Add the jalapeño pepper and garlic and saute for 2-3 minutes. Add the kidney beans, cumin, oregano, salt and pepper and simmer over low heat for approx 10. Spray cooking pan with olive oil spray and spread shrimp out in a single layer. Spray shrimp with light coat of olive oil spray. Roast for 8 - 10 minutes, until just pink, firm and cooked through. Serve shrimp over kidney beans and coconut rice and garnish with chopped cilantro. Note: the picture shows chives as garnish, but I think the cilantro is a better flavor with this dish.